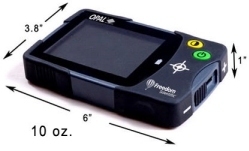 As the smallest, most feature-packed ultra-portable video magnifier, the OPAL� provides the best value in an on-the-go solution for those with low vision. For the many people who need help reading text and seeing details because of low vision,optical magnifiers work only up to a point. The OPAL portable video magnifier takes magnification to the next level and beyond. The OPAL�s full color, high brightness video screen makes it outstanding for reading bills and writing letters and checks. It is small and unobtrusive so that it slips into a coat pocket or purse. A perfect traveling companion for visiting the grocery store, pharmacy, bank, library, bookstore, restaurant, or anywhere else. 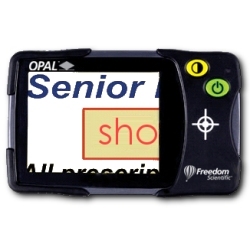 Prop the OPAL on its built-in stand and sign documents and checks with greater assurance. The OPAL is easy to use. Just turn it on with one button, lay it directly on an object, and adjust the magnification level with the easy zoom slider. With the mode button, you can adjust the screen from full color for viewing pictures to any of five high contrast text modes.